With the new storage facilities built by the project, Afghan farmers in Kabul and Parwan were able to reduce losses in their potato and onion harvests. Photo credits: ADB. The Enhanced Agricultural Value Chains for Sustainable Livelihoods Project aims to improve Afghanistan’s rural sector by addressing agricultural issues in a comprehensive way. Instead of focusing on a single component, it looked at the entire agricultural value chain and provided solutions where an issue was found, making sure that nothing gets left behind. This strategy ensured that the components needed to improve farmers' incomes and to stimulate local and national growth are well in place. The country’s major source of livelihood is agriculture. The sector employed 62.2% of the national workforce of 10.9 million people in 2017 and contributed 21.9% of the GDP amounting to $4.1 billion in 2016.3 Agriculture is a significant source of foreign exchange earnings, contributing $375 million or 48.6% of total export earnings of $771 million in 2016. 1 Government of Afghanistan, Central Statistics Organization. 2017. Afghanistan Living Conditions Survey (2016– 2017). Kabul. 2 World Bank. World Development Indicators. 3 The Global Economy. Afghanistan: GDP share of agriculture. Almost 85% of the Afghan people live in rural areas, and most are dependent on agriculture. About 36% of households rely on farming as their main income. Some 6% of households depend on farm wages. 4 Asian Development Bank. August 2012, Proposed Grant Assistance Islamic Republic of Afghanistan: Enhanced Agricultural Value Chains for Sustainable Livelihoods. 5 Asian Development Bank, No date. Afghanistan Infrastructure Trust Fund. Farmers underwent training, which included visiting a demonstration plot for potatoes (right) in Bamyan province, where an earlier project built 1,100 potato-storage facilities. Photo credit: Project Management Office/Ministry of Agriculture Irrigation and Livestock. This project built on the gains made by an earlier project cofinanced by ADB and the Japan Fund for Poverty Reduction (JFPR)—the Rural Business Support Project. 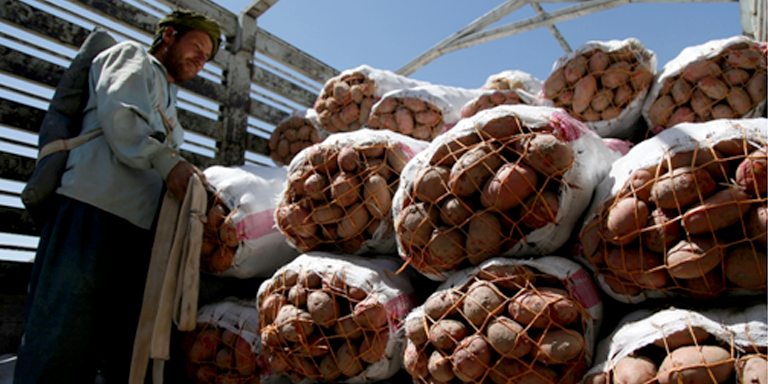 It built 1,100 potato-storage facilities for poor farmers in Bamyan Province from 2007 to 2011. The Enhanced Value Chains project, co-financed by another $18.5 million grant from JFPR, replicated this solution and spread it beyond Bamyan to the provinces of Kabul and Parwan. This project banked on the three-way partnership of ADB, JFPR, and the Afghanistan government. This collaboration has given the rural poor the opportunity to produce more efficiently, reduce their post-harvest losses, and increase their incomes because it allowed the three organizations to combine their resources to directly benefit the rural poor. ADB provided technical expertise and project oversight, JFPR provided the grant, and the government contributed to project implementation. LEFT: Onion storage facility built by the project in Kabul province. RIGHT: Potato storage facility in Bamyan. Photo credit: Project Management Office/Ministry of Agriculture Irrigation and Livestock. The storage facilities this project provided did not use state of the art technology; it replicated the storage facilities in Bamyan province made from bricks and stones. These structures reduce damage from weather and pests and keep the internal temperature within 7–10 degrees Celsius and relative humidity below 95%. They are partly below the ground and do not require energy. This simple and practical structure can store potatoes for up to 3 to 5 months, with losses of only around 3%, reduced from 40% through traditional potato storing facilities. The project also built the capacity of farmers and cooperatives on better production and management techniques, including improved vegetable farming and storage. The project linked the farmers to national and regional markets by forming them into cooperative groups and networking them with local community development councils. The project began in 2012 and ended in June 2017. From Bamyan Province, it spread the construction and use of potato storage facilities to Kabul and Parwan, building over 2,800 potato and onion storage facilities. These structures helped reduced losses in potato and onion harvests—potato spoilage declined from 40% to 3%, while onion losses went down from 40% to 19%. It also trained 12,458 farmers, of whom 20% are female, in agriculture production practices, integrated pest management, and pre- and post-harvest handling and management. It also formed 127 male farmer cooperatives and 55 female farmer cooperatives in the Sheber District. These became their access points for improved seeds, planting techniques, and training. This project highlights the need to look into the elements of the agricultural value chains to determine at which point the farmers need the most assistance. This strategy ensures that all aspects of the agribusiness are made more efficient, which contributes to higher production and incomes, and lowers losses. Moreover, the comprehensive approach ensures that beneficiaries’ capacity to engage in profitable ventures is developed in tandem with the facilities. The project enhanced linkages among agribusiness stakeholders too, helping stimulate local economies. This project was able to provide a solution that was most suitable to the country’s rural poor, not by reinventing the wheel, but by replicating a pro-poor designed storage facility. These structures were easy and affordable to build and maintain. This type of design directly targets and empowers impoverished beneficiaries because they can easily replicate it, even beyond project duration. The project also promoted collaboration and participation. It gave farmers access to services that enabled them to productively engage in rural development. By establishing demonstration plots, engaging with farmers in cultivation, and providing extension services, the project was able to provide both male and female farmers access points for capacity building, market linkages, and other agriculture services. Asian Development Bank (ADB). Afghanistan: Enhanced Value Chains Project. ADB. 2016. Afghanistan: A Simple Solution for Farmers. Project Result/Case Study. 13 April. Mohammad Hanif Ayubi is a Senior Project Officer/Sector Lead at ADB’s Afghanistan Resident Mission.